Black Kato is the current champion. 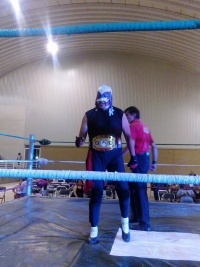 He won the title on May 27th, 2017 in Domo de la Deportiva Ciudad Jardin, Ciudad Nezahualcóyotl, Estado de México. In August of 2012, Diamante Azul lost the on a show in San Luis Potosi to local luchador Ku Klux Klan in an upset, and without any controversy. Despite this, CMLL ignored the outcome and refers to Azul as champion on television. Azul presented his tag team championship belt as the DF title for the title change, but the correct championship belt was swapped in at some point and is the belt currently defended.
? Tamba ? ? ?
? Kiss ? ? ?
? MS-1 ? ? ?
? As Charro ? ? ?
? Rokambole As Charro 1989.??.?? ?
? Black Lord ? ? ? This page was last edited on 20 June 2017, at 15:14.